In search of the perfect beachfront vacation? A place to visit with a wide, sandy dramatic beach? You want more… you want tranquil settings, you want to watch the sunset over a giant saltwater marsh. Maybe go kayaking or canoe a scenic waterway filled with natural wildlife. You want to explore jettyies and tidal rivers to fish for that famed striped bass. But wait, you want more in your fantasy vacation, that you want dining options, everything from roadside clam shacks to fine sea view dining to mouthwatering pizza by the slice. Golf too, 18-hole championship courses to challenge the most skilled golfer. Plus you want family fun miniature golf courses. Wow… you really do want it all … there is only one beach to visit then…. Old Orchard Beach, where you will find all this and much more. Here you will find far more to do than you can squeeze into a week. In fact, many visit and end up spending a lifetime (how do you think we got here)! It is impossible not to have the time of your life in Old Orchard Beach. The gentle surf makes this a favorite spot for swimming, sunbathing, and making new friends. When the kids get hungry, they can explore the Boardwalk for pizza, French fries, hot dogs and cheeseburgers, or you can choose from the many family-style restaurants around town. Try your luck at the video games, jump on a ride, treat yourself to an ice cream or a frosty cool soda. Thrills, chills and frills-take your pick or do it all. Catering to families is a way of life in Old Orchard Beach. The Beach, the arcades and amusement rides, nightly entertainment, golf, fishing, auto races and harness racing are just a few favorite activities in the Old Orchard Beach area. Old Orchard’s Pier is the center of the recreational offerings. Extending nearly 500 feet over the Atlantic Ocean, the Pier and nearby Victorian Square feature shops, eateries, games of skill, and nightlife. During the summer, there are almost daily special events, festivals, fairs, concerts, street dances, and fireworks to entertain all. Oh and did we mention, the omnipresent beach always there, always luring you into its peace and tranquility. Old Orchard Beach is easy to reach by plane, train or automobile. The Downeaster - Amtrak train stops in Old Orchard Beach six times daily (May - October) and Interstate Highways are just minutes from the beach. By air, we are serviced by the Portland Jetport, 13 miles north. Boston’s Logan and Manchester (NH) International Airports are less than 2 hours away each. Local bus service is directed to the center of town where you have easy access to numerous accommodations. 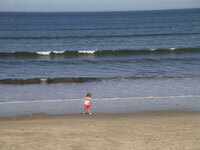 You’ll also find that Old Orchard Beach is ideally situated if your interests go beyond a lazy day at the beach. The Route One corridor just west of town is a beehive of activity with two water parks, an amusement park, restaurants and The Shops at Biddeford Crossing. Twelve miles to our north is the popular Maine Mall with a vast array of stores, shops and restaurants. The historic Old Port, with its cobblestone streets adjacent to Portland Harbor, is a dining, entertainment and boutique shopping delight. 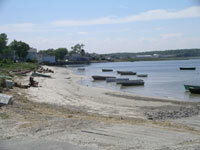 Old Orchard Beach is surrounded by the idyllic seaside communities of Ocean Park, Pine Point and Camp Ellis. The cities of Portland and Kennebunkport are two of our nearby neighbors, offering a variety of harbor activities and more shopping. 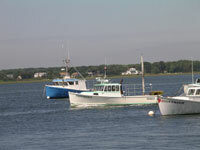 New England’s largest salt marsh is off Route 9 in neighboring Scarborough with guided nature walks and canoe tours. Less than 30 minutes north is the bustling factory outlet town of Freeport, home of the world-famous L.L. Bean store, open 24/7, 365 days a year. And a new Cabela’s World’s Foremost Outfitter Store is opening in adjacent Scarborough. Further north, Maine’s rocky coast beckons with such popular destinations as Boothbay Harbor, Camden, Bar Harbor and Acadia National Park.